The aesthetic appearance of various objects is important to human beings. One measure of the quality of an object is its surface quality, which can be characterized with the concept of gloss. Nowadays measurement of the gloss is a routine off-line method in assessment of quality of product at various sectors of industry. The book gives a fresh treatment on the concept of gloss. Theoretical description will be on more general basis of optical physics than in other sources. The text will give a modern treatise of machine vision based glossmeters and furnish the ideas how to measure and analyse gloss from complex-structured objects. Innovations of machine vision and gloss data analysis by embedded micro-controllers and microprocessors are trademarks that fill the gaps of older textbooks. This book is suitable for university students, polytechnic students, teachers and engineers and companies. It is also suitable for pharmaceutical tablet makers and workshops. Raimo Silvennoinen received the PhD degree in physics from the University of Joensuu in 1990. He joined the Faculty of Natural Sciences at the University of Joensuu in 1975, where he is currently an assistant professor in physics. Dr Silvennoinen is interested in optics and optoelectronics, optical metrology and their applications. He is co-author for more than 85 original articles in refereed journals. He is also member of the Finnish Optical Society (FOS), OSA, SPIE, and AAAS. 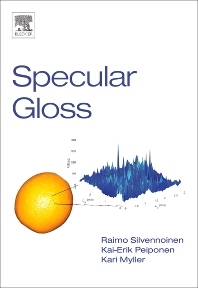 Professor Peiponen has written 3 books related to optical spectroscopy. He has contributed to the fields of industrial optical inspection, optical spectroscopy and optical properties of nano structures. In addition to original papers on optics he has contributed didactical optics. Kari Myller received the Ph.D degree in physics in 2004. The subject of his research was gloss measurement. At the moment he is researcher in InFotonics Center Joensuu and also performs duties of managing director of MGM-Devices Ltd. MGM-Devices is a high-tech company in the field of optical quality control. The main goal of MGM is development and fabrication of a modern diffractive optical element based glossmeter.